A lawyer who became politically active after the First British Invasion in 1806, Juan José Paso was one of the most outspoken founding fathers of Argentine independence. Lack of free trade as well as the occupation of Spain by France were key factors in Argentina proclaiming independence. Paso worked in the tax office for the Viceroy but did not hesitate to join the nascent revolution. Forming part of the 9-member Primera Junta (First Council) on May 25, 1810, Juan José Paso served as one of the secretaries. Soon after in Montevideo, he tried to convince the sister city of Buenos Aires that independence was in everyone’s best interest. Not many were willing to listen. Disagreement among factions in the region would lead to the collapse of the council. Paso later became part of a brief-lived triumvirate, then joined sides with independence heroes José de San Martín & Carlos Alvear. Missions to Chile & defending Admiral Guillermo Brown in court occupied his time soon after. Even though Paso never resumed a top political position after the triumvirate, he was a key figure in the new nation’s development. Paso worked on the first draft of the Argentine constitution in 1819 & continued to represent the interests of Buenos Aires in Congress for the remainder of his life. Juan José Paso died in 1833 with little fortune to show for the service given to his country. 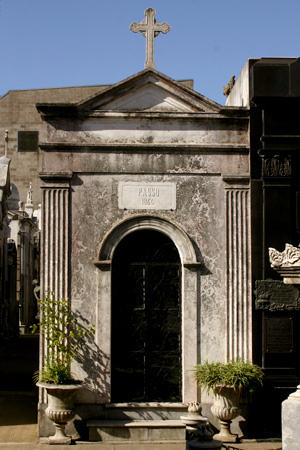 In fact, the Governor of Buenos Aires at the time decided to raise funds for this tomb in gratitude for Paso’s dedication. There are two distinct spellings of his last name: Paso & Passo. With ancestors from northern Spain, their last name in gallego was Do Pazo. The “z” was later replaced with either one “s” or two. Take your pick.